What exactly was the Inquisition? (If you prefer to listen to my reply, click on the arrow for the podcast, The Inquisition (20 min). If you want to save and listen later, right click here and 'save link as' or 'save target as'). Most of us have heard of the Inquisition, but may be sketchy on the details. Yet this is important stuff - an aspect of history that we definitely don't want repeating itself. According to the Oxford English Dictionary, the Inquisition is "An ecclesiastical tribunal established by Pope Gregory IX c.1232 for the suppression of heresy. It was active chiefly in northern Italy and southern France, becoming notorious for the use of torture. In 1542 the papal Inquisition was re-established to combat Protestantism, eventually becoming an organ of papal government." Inquisition < Lat. inquirere, to inquire, and inquisitio (noun form). The inquisitor is the one making the inquiry. Ecclesiastical: pertaining to the church (ecclesia). Tribunal: Each session was more or less a session of court. The ecclesiastical authority, after examining the alleged heretic, hand the him (or her) over to the civil authorities, knowing full well what punishment would be inflicted. Heresy: not primarily about false teaching, but about division (Gk. haeresis). A threat to the community at least as much as a threat to doctrinal purity of the church. Combating Protestant teaching, as well as in the suppression of Muslims and Jews (esp. in the 1400s). It is theoretically possible that some early Christians took severe measures to ensure doctrinal conformity, yet there is no evidence of this in church history until the early Middle Ages. In 385 AD Priscilla and six of her followers were beheaded at Trèves (France). Yet this event postdates the great apostasy. The church had been sliding into worldliness and biblical error for several generations. The church state was a monstrous hybrid, a creature that ought not to have existed. Before 1100 AD, local clergy maintained doctrinal discipline. At times erring members were imprisoned (without torture). Execution was rare. It is arguable that the First Inquisition at Languedoc, in Southern France, in 1184, although the Inquisition had not been established as a permanent institution until the 1230s, under Pope Gregory IX. Life in prison was offered to those who recanted, execution for those who did not. Isabella and Ferdinand are better known for their interactions with Christopher Columbus, beginning in 1492, as well as for their expulsion of the Jews from Spain (also in 1492) along with resumption of the Reconquista (Reconquest), the effort to reclaim land and loyalty from the Muslims, dwelling in Spain since the 8th century. Many Jews and som e Muslims pretended to be Christian, in order not to be captured. The last execution of the Spanish Inquisition took place in 1826, of a schoolteacher who was a deist (one who denies the God of the Bible, miracles, the incarnation, etc -- more or less than worldview of many of the founding fathers of the fledgling American republic. The Inquisition was established in Portugal in 1536. From there is reached Goa (southwest India) in 1560. The Spanish Inquisition was taken to the New World, especially notorious in Peru and Mexico. Galileo ran afoul of the Inquisition in 1633. It is not true that he was executed for promoting his idea that the earth orbited the sun, although he was censured (and censored) and placed under house arrest. Many intellectuals -- all intellectuals were Catholic in Italy and other European countries, so this was hardly a case of the Church vs. Science! -- probably agreed with Galileo, yet preferred the public not be informed of the latest scientific discoveries. They feared that a crisis of confidence might be triggered, particularly as the ignorant were unable to understand the science or theology. The church, in other words, was protecting the power structure. 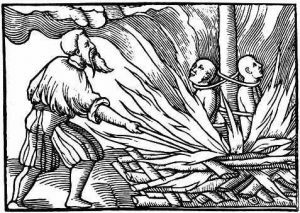 As for execution, heretics were often burned at the stake. In the past I had heard that 100,000s had been executed -- and unfortunately repeated this figure -- yet the true total appears to be in the 1000s. (An exaggeration by opponents of the Catholic Church?) To see what the Bible says about execution, listen to my podcast on Capital Punishment (website membership and login required). The Inquisition still exists today, though without the torture and death. Its current name (since 1542) is the "Congregation for the Doctrine of the Faith." Uniformity must not be mistaken for unity. Church and state were separate in the early Christian period, and that separation was (and is) for the good of all. Jesus specifically forbade us to lead by authority and power as worldly leaders do: no lording it over others! Where there is a high degree of social solidarity (tribal regions, chiefdoms, traditional societies), leaders will need to wrestle with these issues. Don’t just surrender; history need not be repeated. Foster a spirit of tolerance and respect. We ought to represent others fairly -- individuals as well as groups. Demonizing of Jews, Muslims and heterodox Christians still takes place, both without and within the church. Let's take teaching ministry seriously, but leave final judgment to God. Let's strive for an atmosphere of openness, welcoming questions and dialogue. It is easy to condemn the Catholic Church for its extreme measures. While shock is merited, we in the modern age are likely to underestimate the seriousness (and fear) with which dissent was viewed by secular and ecclesiastical leaders, from the Middle Ages until relatively modern times. Since dissent constituted sedition, heresy was taken with the utmost seriousness. This was not an age of freedom of speech or equity in law, but an age of social solidarity. Inquisitorial measures were adopted not so much for the good of the heretic as for the good of society, by instilling fear in order to maintain conformity. Such practices are forbidden to followers of Christ.